I knew the second I arrived, I would reserve an entire blog post for this place. Last spring when we started planning this trip, a friend was traveling Asia. She posted a picture of her and an adorable elephant, and the rest was history. I emailed her immediately to find out where the heck she was. 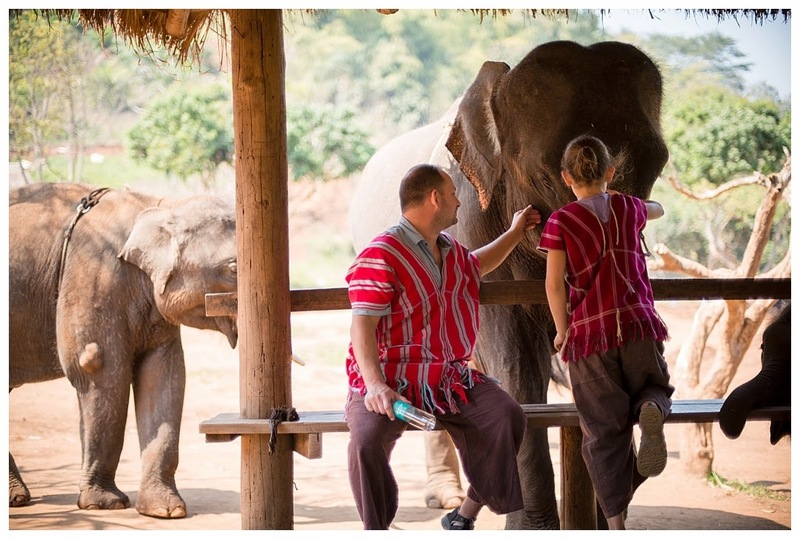 We checked out Patara, watched every video on their website and fell in love with their program and their elephants. 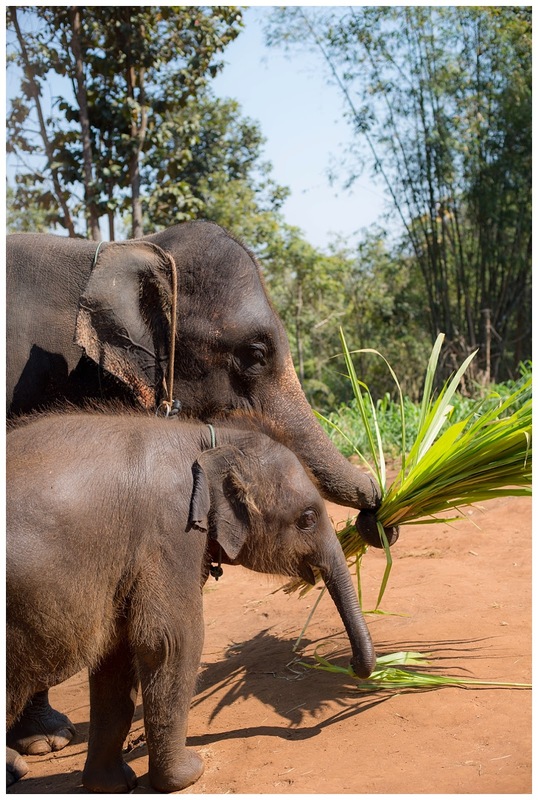 As we got closer to our trip departure date, we enjoyed watching elephant calf after elephant calf arriving at the farm....knowing we would soon get to meet them in real life! Chiang Mai has to be one of the coolest cities I've ever visited. I loved everything about it. Patara is a beautiful hour long drive outside of Chiang Mai. As we headed out of the city, we drove through these small towns in awe of the simplicity and beauty of the Thai culture! Our day at Patara also happened to be my fabulous husband's birthday. I mean, does it get better than that? Riding elephants through the jungle on your birthday?!!!! But this day was much more than riding elephants. As we quickly realized in our travels, one needs to be very choiceful about where you experience different things in Thailand. Especially elephants. As we learned from Pat (the amazing owner of Patara) the elephant population has decreased nearly by half in the last 40 years in Thailand. Elephants are often overworked and not well taken care of. Pat's dad actually started Patara in 1968. 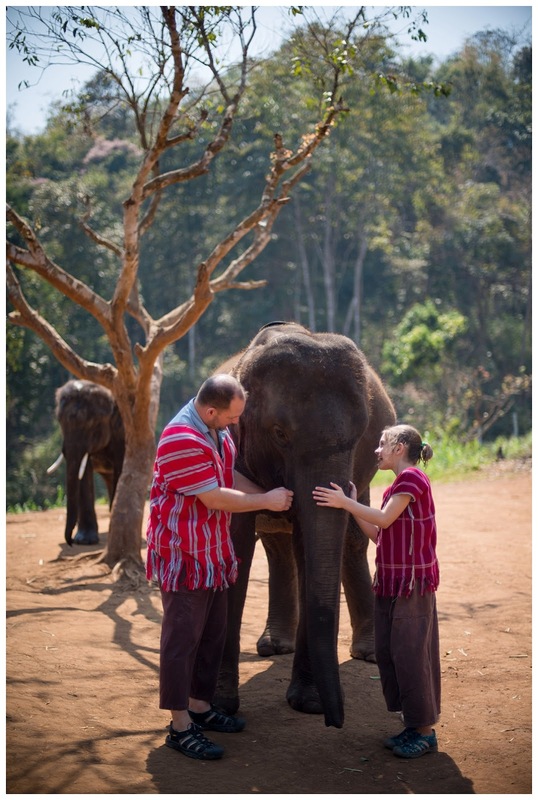 Pat was raised with the elephants and a commitment to love them and care for them and help grow the population. I saw quite a few elephants on our trip, but the elephants that came around the corner that morning were the most happy, smiley, healthiest looking elephants I'd ever seen! We proceeded to learn more than I could have ever imagined about this gentle, strong animal. How to know if they are healthy, how to know if they slept well, why and how to clean them, how herds grow together, the aging process, commands for positively reinforcing them, feeding them....you name it, they taught us! 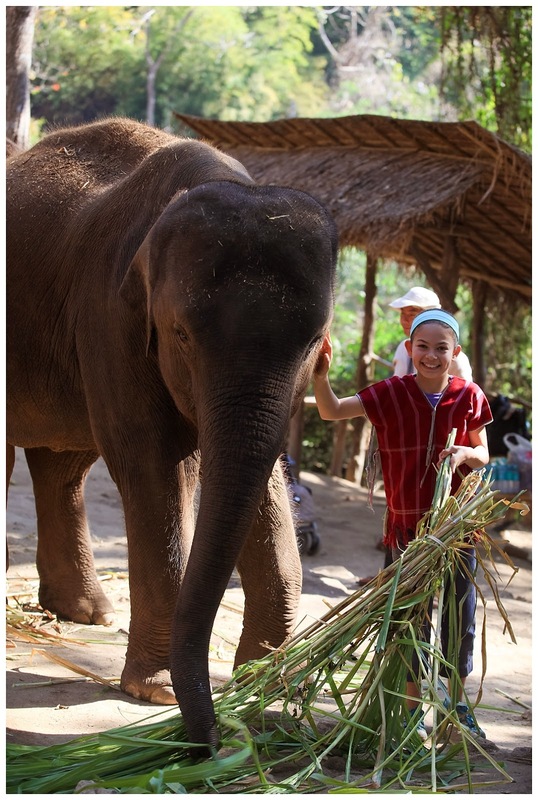 And yes, I squeezed my elephants poop to find out how hydrated she was - she was well hydrated! We were assigned our elephants for the day early on! 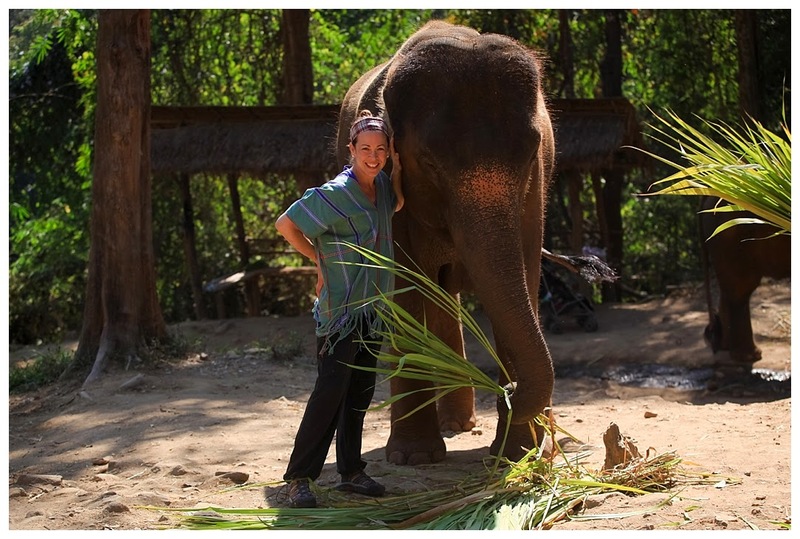 Every elephant has what is called a "mahout" - essentially a handler that is with them all day and all night. They never left our side. In fact the snazzy outfits we wore were the same attire of the mahouts. They had us wear the same so the elephants perceived us as a safe person! 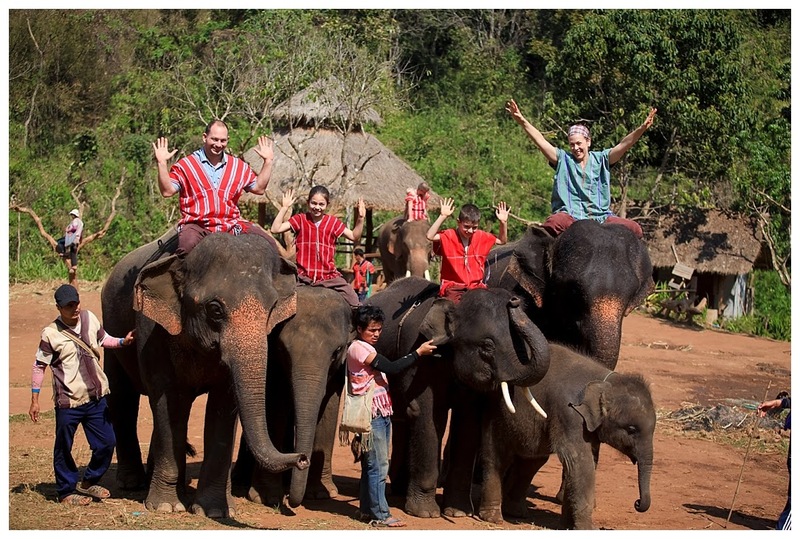 Meet our elephants for the day! And this is Bun Jun. She has a 3 month old sweet girl named Arin. I was lucky enough to hang with them for the day! you must put this amazing place on your "to experience" list! So let me just share my fav highlights of this day!!! 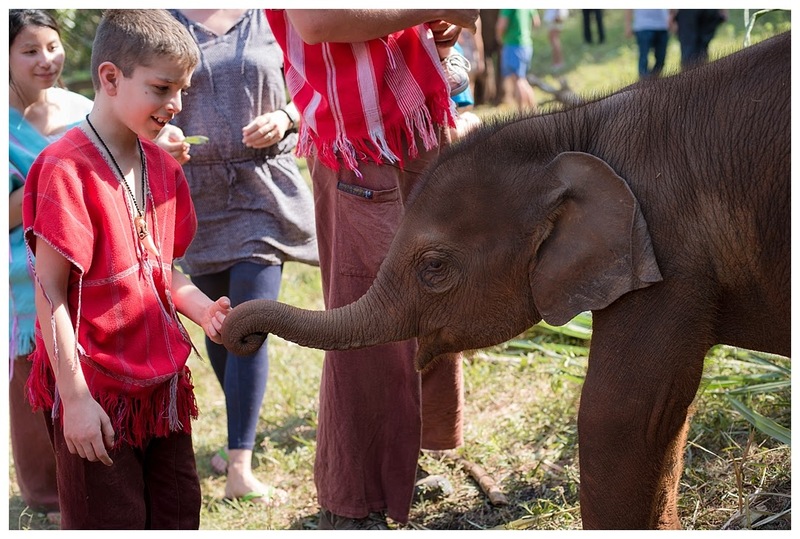 Meeting the elephants and and just loving on them. Are you kidding??? CRAZY and so awesome! When we took breaks, Jing would always mosey over to come find Audrey. I think her heart melted about 100 times on this day! Remembering when Pat said "trust in the footsteps of the elephant....they will never falter". He was right and as I sat on top of Bun Jun's head riding through jungle (imagine their ears are like a seatbelt), I closed my eyes and repeated his words. You see, Arin is Bun Jun's 3 month old baby girl. She joined us on the walk and was like any other baby - running all over. Bun Jun would constantly keep watch! There were a few times we had steep inclines on either side of us, and Arin would run by. Bun Jun would literally turn her head (with me on top) which ultimately had me hanging over the steep incline! YIKES! Thank goodness for Pat's words!!!! Her footsteps never faltered. 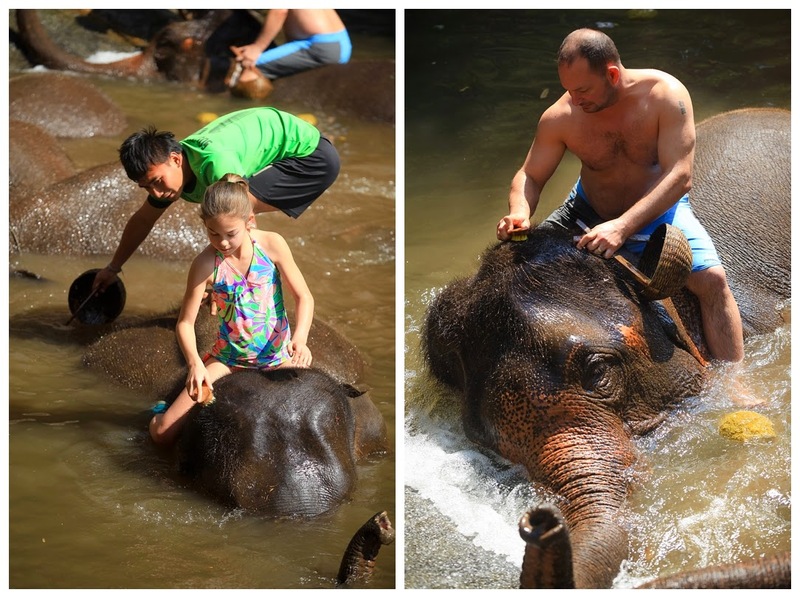 We learned so much about bathing and cleaning elephants....why we do it and the best way! 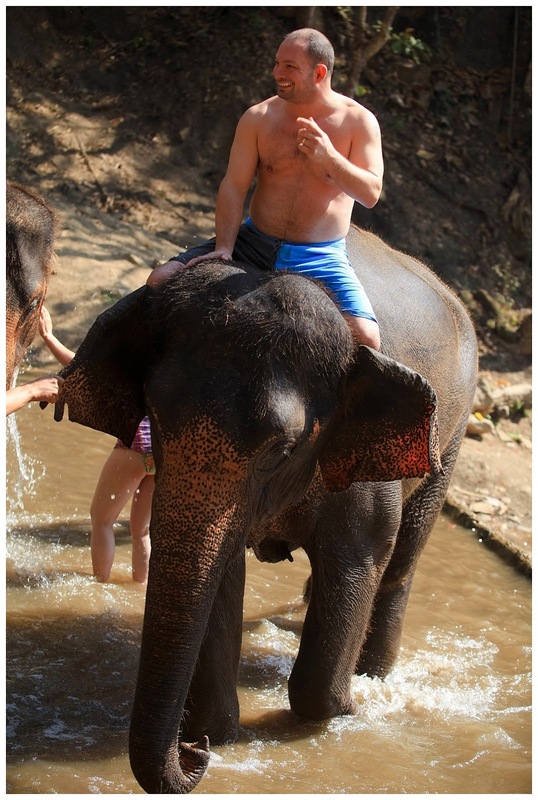 Was I kind of freaking out that I was in the water with elephants.....yes. Did we all love it.....YES! Learning how to get on and off an elephant. Note: This is no easy feat and my dismount did involve sliding down her trunk! Notice how they lift their foot? Elephants are so smart and so teachable. Baby elephants! 3 months, 6 months, 28 days. Cutest I've ever seen. Those baby trunks! And they want to play like a puppy! it's a little different! HA! 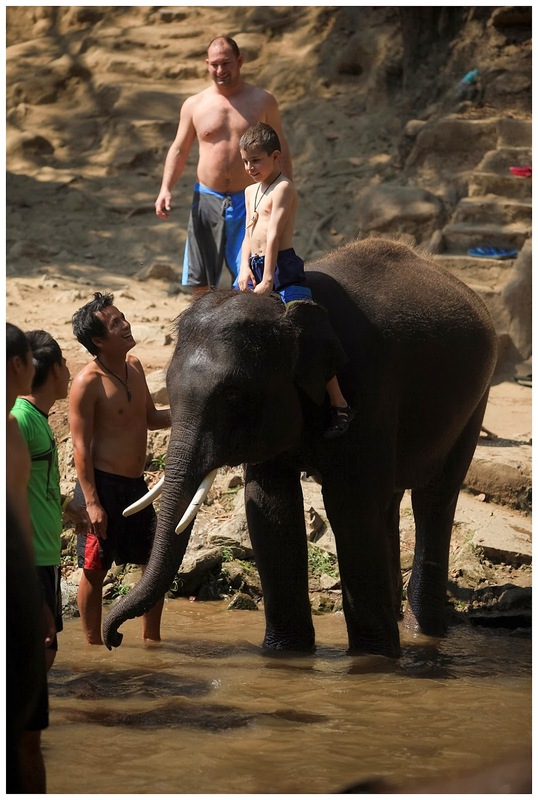 Turning around and seeing Nate trying everything he can to "encourage" his elephant, Prai Na, to move a little faster. Elephants are not fast. They are slow and steady. In case you don't know Nate very well, he likes to be the line leader! FYI, Nate and Prai Na were well matched. It was pretty hilarious! Watching Audrey and Jing. Two peaceful souls perfectly matched for this day. Initially, Audrey wasn't sure if she wanted her own elephant or to ride with either myself or Todd. We talked and I told her it was absolutely her decision. I often remind my kids that they should never let "feeling scared" keep them from trying something new.....because they might just miss out on the coolest experience. 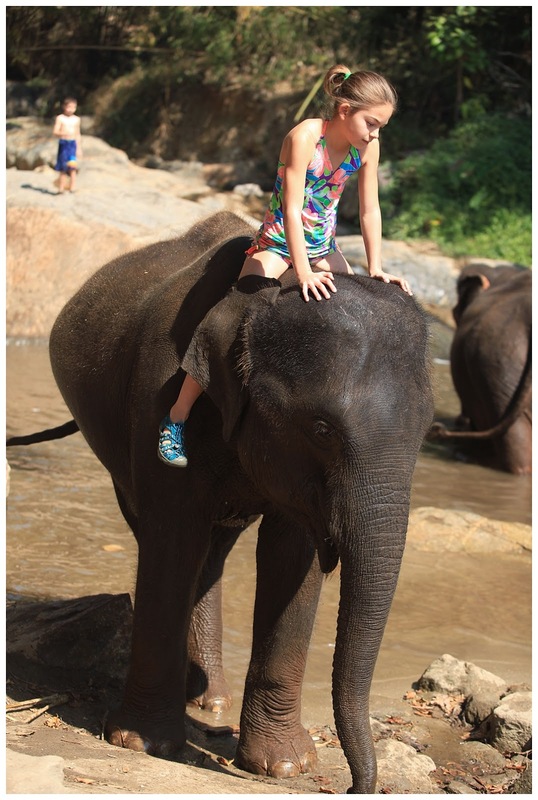 Well, Audrey told me soon after we arrived that she would be riding her own elephant that day! HOORAY! It was perfection. And reading her journaling from this day pretty much makes me melt! Half way through our day, we arrived upon this huge opening where we had one of the best meals of our trip. We hung out with the two other families in our group (one from Lithuania and one from China). The elephants just roamed around and came to visit. The BEST! Todd Gendreau, I hope you had the best birthday ever. 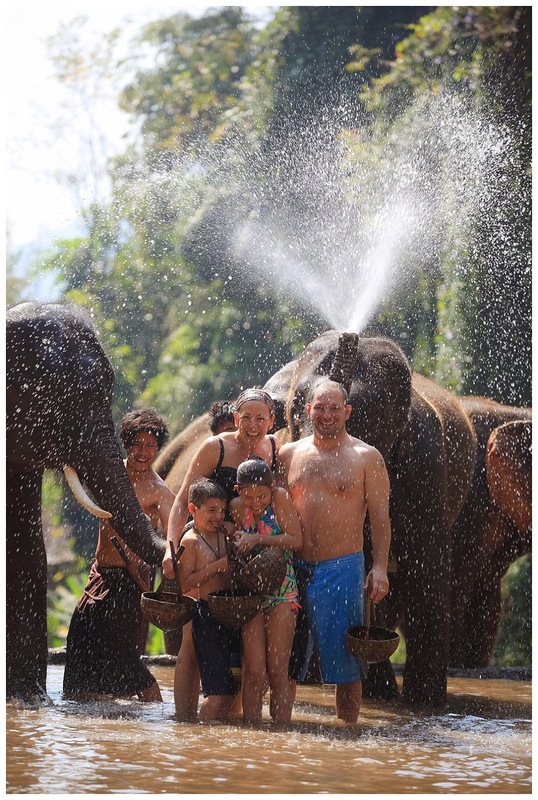 Even if you don't go to Thailand - go follow Patara on Facebook and watch their videos on their website. I literally cry. I am ridiculous, though, I know! Phew, so glad to have this blogged and forever documented. What a day!